To the folks of the Heartlands, these lands are the mysterious, exotic, and deadly east, a region of terrible magic, untold wealth, and strange and capricious laws. The term "Unapproachable" generally describes the distance from the Heartlands of Faerûn, but some of these countries are considered unapproachable because of their temperament. Thay is an aggressive magocracy, Aglarond defends its borders against all intruders, and Rashemen is a cold, hard land of powerful witches and fierce warriors. The lands of the Unapproachable East trade with the Old Empires because of their proximity, and Thesk is the avenue through which exotic goods from the far eastern lands of Kara-Tur enter Faerûn. This region is known for its powerful and strange magic. Aglarond is ruled by Faerûn's most powerful sorcerer, Thay is under the dominion of the Red Wizards, and the mysterious Witches of Rashemen guide that land's berserker defenders. Aglarond is hailed as the nation that keeps the Red Wizards from attacking the rest of civilized Faerûn, and the home of the powerful sorcerer known as the Simbul. Few give the country any more thought than this, but Aglarond is a place of ancient magic that holds one of the largest half-elf settlements in the world. Its army defends its borders against Thay; and its skilled rangers scout its frontier in search of trouble. The small beaches on Aglarond's rocky coast are dotted with fishing villages, and since the Simbul has declared that all pirates are to be considered agents of Thay (and put to death if caught), the waters around Aglarond are very safe to travel. It is one of the few kingdoms that refuses to allow Red Wizard enclaves within its borders. The humans of Aglarond are sturdy, no-nonsense fisherfolk, farmers, and herders unconcerned with the rest of Faerûn. They are slow to warm to a person but faithful to those they trust. A serious and hard-working people, they nevertheless enjoy revelry and exuberant celebration when their chores are done. They dislike magic, pointing to the Red Wizards as proof that magic is a corrupting tool of wickedness. The exceptions are unusually good individuals, such as the rulers of their land who have always used magic to defend them. They believe in the divine powers, but have few large temples. The half-elves of the Yuirwood are descended from wood elves. The various tribal groups that live deeper within the forest assume a nomadic and tribal culture, while those on the outskirts abide by local human customs. They have no qualms about using magic, and some of the wilder tribes know strange old elven secrets of the Yuirwood. All people of Aglarond are respectful of the Simbul, because it is her power that has kept the Red Wizards at bay for so long. How ever, that same power and her impetuous nature breed suspicion of her methods and motives. Aglarond is a wooded peninsula projecting westward into the center of the Sea of Fallen Stars. It divides the Easting Reach from the Alamber Sea. 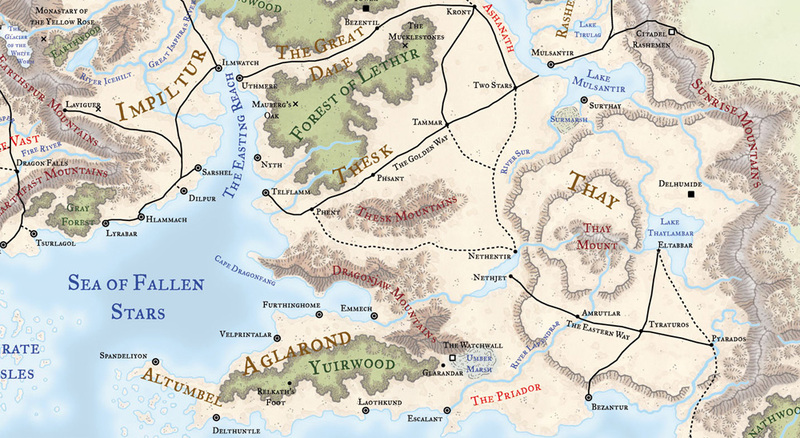 Tannath Mountains: This range forms the southern edge of the Dragonjaw Mountains, south of the River Umber. The mountains are tall and rugged, flanked by wide passes. They have never been settled by humanoids, but griffons fly in the high peaks, and boulder-like creatures called galeb duhr live here. The Watchwall, a thirty-foot tall, ten-foot wide wall of smooth, seamless stone, runs for several miles from the mountains toward the fortress Glarondar in the Yuirwood. Umber Marshes: This span of bogs, swampland, and mudflats is Aglarond's first line of defense against Thay. Inhabited by dangerous creatures such as stirges, poisonous snakes, hydras, shambling mounds, trolls, and disease-carrying insects, the swamp has foiled attacks by Thayan armies more than once. Yuirwood: Home to the kingdom's half-elves, this forest is filled with old ruins. Detection and scrying magic cannot reach into the forest, and those who try see only a cluster of unremarkable trees rather than what they're looking for. This effect makes it difficult for enemies to discover the half-elves' settlements and fortifications. Some of the forest's stone 'circle's act as portals to elsewhere in Toril (including Evermeet) and even other worlds. Aglarond proper consists of the Yuirwood and the cities on the northern coast of the peninsula. The cities on the southern coast are independent and greatly threatened by Thay. Altumbel: This small human kingdom occupies the westernmost portion of the Aglarondan peninsula. It is loosely allied with Aglarond but has little contact with its neighbors. Its people are extremely reclusive, isolated, and outwardly hostile to non-humans. The dreary, constantly windswept place survives by fishing. Emmech (Small City, 7,620): This grim fortress holds over a third of Aglarond's army. A small town has sprung up around it, with the fortress looking over the town from a low hill. It holds enough supplies to feed its soldiers and everyone in the town for up to a six-month siege. Furthinghome (Metropolis, 40,643): One of the first human settlements here, Furthinghome is a poor community, with many on the outskirts living in lean-tos and thatch huts. Its greenhouses hold the cultivated tropical flowers for which the city is known. The coastal waters are shallow, only allowing small vessels. Relkath's Foot (Small City, 5,O8O): The largest permanent settlement of half-elves in the Yuirwood, this town is built around four large and very old trees. The town's militia is active in the region, frequently practicing ambushes and spying on passersby. Human rangers often seek training from the foresters of Relkath's Foot. Velprintalar (Metropolis, 66,044): This is the only major port in Aglarond. Its narrow buildings jumbled together can be confusing to visitors, and the city has no walls. Velprintalar is the meeting-place for Aglarond's council and the location of the Simbul's palace of green stone. Long ago, the Yuirwood was inhabited by wood elves. They mastered powerful magic, built stone menhirs and 'circle's, and lived peacefully within their realm. Eventually monsters pushed into the elves' territory, and the elves retreated to areas deeper within the wood. Humans arrived in this region in 756 DR, settling in the south, cutting wood, and clashing with monsters and the elves. When adventurers came to slay monsters, the elves of the Yuirwood retreated farther into the wood. After a time, humans penetrated the wards of the Yuir and allied with the weary elves. The humans helped the elves destroy monsters, and the two races intermarried. Their half-elven descendants began to reclaim the wood. Eventually they came into conflict with the humans on the coast, who had continued breed, populate, and log the forest The angry half-elves told the humans to stop but were ignored, and so they raided against the coastal dwellers, driving away or killing humans who resisted. In 1065 DR they fought the battle of Ingdal's Arm and sued for peace between the races, creating the nation of Aglarond. Some of the humans refused to share power and moved to the end of the peninsula to form the country of Altumbel. Aglarond was ruled by a series of half-elven kings, many of whom were killed by Thayan invaders. Two heirs of the royal line, Thara and Ulae (known as the Gray Sisters) took the throne when their brother died, and they kept Aglarond safe for years. Ulae's daughter Ilione selected her apprentice, a woman known only as the Simbul, to be her heir, and the Simbul has defended her country against Thay ever since she took the throne in 1320 DR. In 1371 DR the zulkirs approached the Simbul with an offer cease hostilities and declare a truce, which the Simbul accepted with a healthy dose of skepticism. The Thayans seem to be holding their end of the bargain, so the Simbul has turned her power to improving the lives of her people, as well as expanding the fortifications and wards against her longtime enemies. The old ruins of the Yuirwood bring adventurers to Aglarond, but the folk of the forest watch would-be plunderers and looters very carefully. Dreams of Fire: People in the eastern portion of the Yuirwood have begun experiencing magical hallucinations of the trees burning. There is no pattern to the hallucinations, and some people have had them several times while others not at all. The only link seems to be a Single carved stone half-buried in that part of the forest. A piece of the stone as long as a man's forearm has been chipped or broken from the main mass, and with it some of the elven rune- carvings. The Sentinels: Something is causing the shambling mounds of the Umber Marshes to march toward the south. The shamblers have been forming a line just over a mile from the swamp's southern border, their bodies sometimes writhing with live snakes or buzzing with nests of insects. The plant-monsters stand in the line for days at a time; one occasionally leaves when a replacement arrives. The things attack other creatures they see, but otherwise appear to be waiting for something. Little more than two large forests and the strip of land between them, this land is inhabited by reclusive farmers, coolly hostile druids, and introspective rangers. The people of the Great Dale interact little with the outside world, acquiring the few iron items they cannot manufacture in exchange for herbal, alchemical, and wooden goods of exceptional quality. The soil is rich and suitable for farming, yet few other than the druids live here. The mysterious Nentyarch, a powerful druid or sorcerer, resides in his castle of living trees and destroys all visitors. No outsiders know what he does or if he is the ruler of this place, and the people of the Great Dale answer inquiries to this effect with an uncomfortable shrug. The druids tolerate the trade route that passes between their forests only because caravaneers know that to disturb the forest is death, and accordingly they avoid it. The rangers and druids tend to the plants and animals of their land, train students in the ways of nature, make fine wooden items, acquire rare herbs, and create things of magic and alchemy for trade. Open-minded youths are trained and then sent into the larger world to speak with other druids and rangers. Some of these travelers are given a treant seedling to plant in a deserving forest, or are told to slay followers of Malar. The Great Dale, stretches from the Easting Reach of the Inner Sea to the great lake of Ashane on the borders of Rashemen. Forest of Lethyr: This large forest has a thick canopy overhead, making its interior as dark as twilight even on the brightest days. Visitors report an aura of doom within its confines, and speak of sentient trees that actively resist the progressive decline of the woodlands. Large numbers of druids live in the forest; they are unfriendly to visitors, especially loggers. The southern portions enfold the small settlements of Spearsmouth Dale and Mettledale. Wandering Theskian orcs occasionally forage into the southern reach of the woodland. Rawlinswood: This forest is a near twin to the Forest of Lethyr to the south. Its narrowest point embraces the people of Denderdale, a small settlement of woodcutters and trappers. It is also the home of the Nentyarch and his fortress Dun-Tharos, hidden near the thick center of the wood. A 'circle' of druids camps in the northwestern-most point of the forest, preventing any encroachment by the Damaran town of Tellerth. The fallen empire of Narfell once held most of these lands; but now little remains of their cities and towers except vine-covered ruins in the forest. Bezenul: This waymeet is marked by ten dwarf-high stones spaced along the road at intervals of ten feet, the last of which bears a carving of a tree within a 'circle'. Caravans use it as a rest stop and barter with the locals here. The Mucklestones: This 'circle' of stones carved with nature-runes is a holy site for the druids of Lethyr. The stones sometimes have different arrangements and move as a whole a short distance from year to year. The stones can act as a portal to certain other forests in Faerûn, but some of the location-keys have been lost over time. Nighthawk Tower: This tower is actually an elaborate platform of branches and sturdy rope, built on top of a huge oak tree. Hensoi (NG male human Drdl2 of Silvanus), the druid here, has an affinity for birds of prey, and the local raptors come here if times are hard or they are injured. He is one of the more tolerant druids of the country, although hardly friendly. Tower Threespires: This tower has a broad base with three tall spires projecting from it. Built by a forgotten human who wanted to protect the land against invasions from the east, this tower would have fallen long ago if it weren't for the incredibly thick growth of vines wrapped around it, making it look like a giant three-fingered hand reaching upward. The druids conduct a secret yearly rite in this place. Uthmere (Small City, 8,520): Only associated with the Great Dale by proximity, this place is populated by people from Impiltur, Damara, and Thesk. It serves as a way station for traders, and the residents warn those new to this trade route of the dangers of crossing the druids. Native folk who wish to trade for foreign goods occasionally visit Uthmere. Humans have lived in the Great Dale at least as far back as the Dalesfolk's crossing of the Dragon Reach into Cormanthor in -200 DR. In this entire time, none but humans have, been known to live here. In some places of the forest, ancient elven stone markers can be found, but no other signs of elven civilization. In all likelihood, this forest suffered some sort of calamity or mass exodus of its native elven and fey population, leaving it open to the humans who arrived later. Adventurers come to the Great Dale to explore the forests and their strange ruins, but the land's powerful druids watch carefully over all their travels in the woods. Ruins of Fortress Clymph: Thought to be the legacy of the same person who built Tower Threespires, this ruin is cursed and avoided by the druids, rangers, and natural creatures of the forest. At times some of the outer stones of its walls glow red with heat, and crackling sounds can be heard beneath the earth. The ruin attracts fell creatures from elsewhere, making it a dangerous place. Impiltur is a kingdom of friendly merchants, preferring peace but capable of calculated acts of war when necessary. While the Impilturrans vigorously defend their own borders, the government traditionally remains neutral and leaves neighboring lands to defend themselves. Impilturans see all sorts of raw valuables come from their northern neighbors and exotic goods arrive in their ports. Among Faerûnians elsewhere, Impiltur is often "the Forgotten Kingdom." It has the mines and pines of the northern realms, but lacks witches or tyrants who send armies to attack neighboring countries. Its shipborne trade passes through the hands of either Sembia or Telflamm, so the Impilturran origin of the copper-work, silver, and iron bars is lost to purchasers. Impiltur is also the gateway to the riches of Damara, and a land fast growing in farmers now beginning to export smoked meats, cheeses, and fireslake (strong, sour wine of poor quality but great potency. 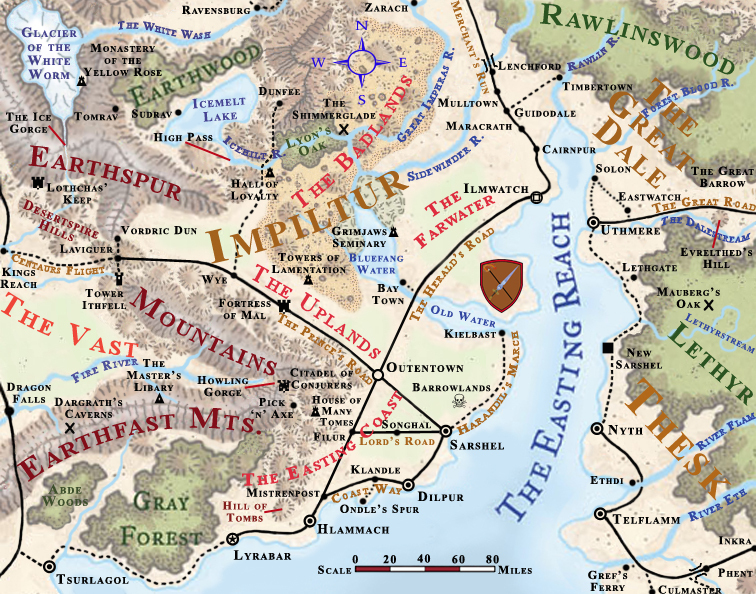 Impiltur is at peace with its neighbors, but persistent brigands, orc and hobgoblin raids out of the Earthspur Mountains, monsters aroused by the ongoing mining and prospecting, and intrigues hatched in the cities of Impiltur by agents of Thay, the newly energetic clergies of Shar, and other dark powers keep the armies of Impiltur war-ready. Impiltur has grown wealthy from trade passing through it, for it is the gateway between the Cold Lands and the nations on the Sea of Fallen Stars. Its people are ready and willing to fight to defend themselves, but enjoy their peaceful lives. The strong militia is capable of fighting on the land, in the mountain lowlands, or on the water. Typical patrols of the Warswords of Impiltur consist of twenty or more chainmail-clad, mounted warriors armed with lances and crossbows. A meeting with formidable monsters or strong foes leads to the summoning of additional patrols, or the hiring of adventurers to serve as "swordpoints." Adventurers on swordpoint duty are allowed some measure of freedom from the usual laws of the land. Given their country's role as a major trading state, Impilturans aren't surprised by different sorts of people, although elves and half-elves are still uncommon in this area. They are proud of the Council of Lords and the widowed Queen Sambryl (CG female human Ari5/Wiz4). The queen herself finds governing boring and prefers to let the council direct matters. Impiltur stretches between the Sea of Fallen Stars and the Earth-spur Mountains. Earthspur Mountains: These tall peaks mark the western border of Impiltur, running from the Moonsea south to the Sea of Fallen Stars. A constant cold wind from the Glacier of the White Worm that tests at their center howls through the peaks. There are few trails and many monsters, but the Earthspurs are rich in gold, silver, and bloodstone. Mining communities survive here, although the dangers of the mountains contribute to a high mortality rate. Persistent rumors speak of a hidden pass leading from Impiltur west to the Vast, but no such route has ever been mapped. The Gray Forest: Long ago this wood was inhabited by moon elves. When hobgoblins and other monsters began to encroach on their territory, the elves warred with them but lost ground steadily. Facing extinction but reluctant to abandon their homes, the elves transformed themselves into majestic trees with gray bark. 'circle's of these are now found within areas of normal trees. Impilturans (and other humanoids) avoid the forest entirely. Impiltur today is a land of opportunity for the hard-working and the adventurous. With each passing month the inhabitants improve the roads, clear land for farms, and push back the frontier. Dilpur (Metropolis, 31,838): This is a moderate-sized trade city, balancing its interests against all of Impiltur. The rulers of Dilpur are aware that an increase in mining is likely to cause merchants to shift to other cities with better access to trade routes and mines, so they stockpile resources to prevent this from occurring. Hlammach (Metropolis, 36,386): This major seaport is walled and compact, populated with merchants, tradesfolk, and sailors. Its extensive docks are filled with ships. Hlammach is the site of the kingdom's mint, and thieves constantly try to steal the coins and trade bars stored here. Its small wizard school mainly teaches magic appropriate to the sea trade and spells to protect and ward valuables. Lyrabar (Metropolis, 52,305): The largest city in this part of Faerûn, Lyrabar is long and narrow, stretching along the water front for nearly a mile. Its large fleet consists of warships and merchant vessels, assuring security of its port. The city has good relations with Procampur and Tsurlagol, and it boasts a small wizard's school specializing in magic helpful to sailing. 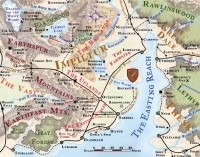 At least two realms of Impiltur have existed along the north coast of the Sea of Fallen Stars between the Earthspur and Earthfast mountains and the Easting Reach. The present realm was founded by the war-captain Imphras, who united four independent cities to face hobgoblin hordes advancing out of the Giantspire Mountains in 1095 DR. One of the military leaders proposed uniting their strength to form a nation, and the others agreed. Impiltur has been a monarchy since, with a council of lords (most of them paladins or of lawful or good alignment) supporting and advising the monarch. Impiltur has a history of nonintervention, letting neighboring lands handle their own affairs unless such a hands-off policy would have major consequences for Impilturans. This policy makes them good trading partners but frustrating friends in times of war, as Damara found when it was invaded by Vaasa. Today, Queen Sambryl, the widow of Imphras IV, rules Impiltur. She prefers to travel the land inspiring her people and aiding them in individual problems, serving as a willing figurehead for the true rulers of Impiltur: the twelve Lords of Imphras II, paladins indirectly descended from Imphras. These twelve serve as the vigilant war-captains of the realm and meet in council often to adjust their defenses and devise tasks for the troublesome or formidable adventurers of the land, sending such ready blades into conflict with Impiltur's foes. Although the Tuigan horde never reached Impiltur, the chaos of refugees fleeing it plunged the realm into poverty, starvation, and brigandry, and order was maintained only within the walled seaport cities. Rich new mines have recently been found north of Lyrabar and near the High Pass, however, and the realm is growing in wealth, trade, and confidence. Forest Secrets: The hobgoblins of the Gray Forest have been marshaling under a new leader. This leader is said to be either a vampire or a werewolf, commanding dire wolves that aid his tribe in their attacks. The hobgoblins may have one or more lairs in the nearby Earthfast Mountains as well as in their forest homes. What Waits Below: One of the newest mines in the Earthspurs has broken through into an old dwarven temple. Exploration of this temple reveals it to be dedicated to Laduguer, the evil deity of the gray dwarves. Several smaller tunnels have been found leading downward. The miners are looking for a band of adventurers to explore the tunnels and determine if they connect to gray dwarven settlements in the Underdark, while at least one merchants' guild is preparing an expedition to see if the gray dwarves would be willing to engage in trade. Rashemen is a cold, rugged land, populated by hardy and fiercely independent people. Its men are berserkers, disdaining armor and fighting with axe, spear, sword, and bow. Its women wield powerful magic tied to the land, training those with magical potential to serve the land and the Rashemi race. Although Rashemen is ostensibly ruled by a powerful warrior called the Iron Lord, the true powers behind the throne are the Witches, who choose the Iron Lord. The land is full of nature spirits, any of which can turn jealous or vindictive against those who offend them. Rashemi laws are simple and based on honor, and they disdain the trappings of civilization. The people are devoted to the warrior ideal competing in athletic contests and other harsh physical activities such as swimming in near-freezing rivers. These challenges keep them strong, for weakness would doom them to death at the claws of the land's many monsters. Faerûn knows Rashemen as the Land of Berserkers, a cold, alpine-and-rock land of fierce warriors ruled by masked Witches. Colorful tales tell of the Witches' cruelty - but such stories stray far from the truth. The Witches rule with absolute authority, sternly and firmly, but they hate cruelty, having repeatedly tasted it at Thayan hands. Rashemi warriors are fur-clad or leather-armored pony riders. Showing cowardice or incompetence at arms results in shunning. They fight in loosely disciplined warbands known as Fangs, each led by a chieftain. In time of war, Witches command the Fangs. When fighting, a Witch of Rashemen wears black robes and a mask, arming herself with magic rings and whips that dance in the air, animating to fight by themselves while their owners cast spells. The armies of Rashemen are commanded by the Huhrong, or Iron Lord, who is expected to be the epitome of the Rashemi warrior. He is chosen by vote of the Witches, during a secret meeting at which any Witch may propose any person as Huhrong. The Iron Lord is expected to rule wisely, keeping order rather than deciding policy. It's his task to keep travel between cities safe, frontiers secure, and marauding monsters to a minimum. The Witches instruct and protect the Iron Lord, and can remove him from office at will. Throughout the land, Witches are revered and heeded. It's certain death to harm a Witch, and usually death to disobey one (unless one is a child, another Witch, or an ignorant outlander defying the word of a Witch for the first time. Among themselves, Witches strive to understand living things and their fellow Rashemi, so that open disputes are few. Their manipulation steers folk toward agreement, and the land is kept strong and united, regarding Thayans as deadly foes and Rashemen as sacred land to be protected and tended. All Witches are female; the few magic-wielding males in the country are known as Vremyonni, or Old Ones, because they are preserved by magic to great age. Kept hidden in the Running Rocks, they devote themselves to crafting new spells and the magic items the Witches use in battle. Most Rashemi never leave the, realm after the dajemma of their youth, a year-long journey wherein youthful Rashemi become adults and see the world. Age, experience, and accomplishment determine rank within the Witches (the age of most Vremyonni placing them high among the Wychiaran, the Witches' name for themselves and then in the same order within all native Rashemi who cannot work magic, with outlanders ranked at the bottom. Rashemi are a short, muscular, hardy race, given to cross-country racing in fierce winter weather, exploring the old northern ruins of fallen Raumathar, and hunting snowcats while unarmored and lightly armed. They herd sheep, goats, and snow rothé, export wool, furs, carved stone, bone, and jhuild, or firewine (which costs as much as 15 gp per tallglass elsewhere in Faerûn} Rashemi love sjorl a heavy, smoky-flavored cheese that outlanders find horrible. To visitors, Rashemen seems very wild, with few cultivated areas, roads little better than dirt tracks, and few dwellings. Rashemi farms are usually hidden in bowl valleys, forest clearings, and along stream banks, with boulder and "wild-hedge" fences. Rashemi homes are typically caves, built into hillsides or covered with earthen mounds. Ashenwood: Thu ancient forest's mighty spirits live in the stones and trees. It is not settled by the Rashemi, and while they sometimes enter the wood to hunt, they do so only after paying respect to the local spirits. Owlbears, trolls, and ettercaps also live here. The High Country: This northernmost portion of the Sunrise Mountains is a place of ancient, dark hills, old stone monoliths, and wild magic. It is home to kobolds, goblins, trolls, wolves, winter wolves, and the ghosts of Rashemi and Tuigan dead. It is sparsely inhabited by grim hunters who prefer solitude. Immil Vale: This area north of the Ashenwood is continually warm and green even in winter. This eternal springtime temperature is due to hot springs and a small amount of volcanic activity; vents and fumaroles of steam are common; often filling the vale with mist. Like most places in Rashemen, there are many spirits here. Lake Ashane: This glacial body of water is also known as the Lake of Tears because of the battles fought on its shores. It is protected by odd aquatic creatures - nixies, nereids, and types unknown, all ruled by a great water spirit. The North Country: Spoken of as a different land, this region contains ruins from Narfell and Raumathar. These ruins are full of ancient magic and treasure protected by guardian spirits, spells, and monsters. Rashemi nobles explore these places to prove their bravery. Urlingwood: This forest at the north end of the Sunrise Mountains is dense and wild. The Witches spend much time here, communing with the spirits, making offerings, performing binding rituals, and brewing the potent Rashemen firewine. Outsiders are forbidden to enter the forest, and those caught are put to death. To protect would-be visitors, representatives of the Iron Lord patrol the outer perimeter. Most Witches actually live in the nearby town of Urling. Rashemi live close to the land, preferring unspoiled wildness to gardens, fences, and elaborate buildings. Rashemi disdain cities as "the wallows of those who've gone soft," and live in the countryside, dressing lightly even in cold weather. Immilmar (Large City, 21,210): This city is home to the Iron Lord's citadel. Crafted of iron and stone, the citadel was built with the aid of the Witches. The central portion of the city is built around the citadel, with farther-out homes more like regular Rashemi homes. The cleric of the small temple of Chauntea here makes sure that worship of "Bhalla" doesn't stray too far from official doctrine. Mulptan (Metropolis, 39,390): This city is Rashemen's northern trading gateway to the outside world. A great field outside town is crowded with traders from many lands. The two primary noble families, the Ydrass and Vrul, sponsor contests as friendly rivals. The competition has improved both families; they are accomplished warriors, hunters, and artisans. Mulsantir (Large Town, 4,948): This town is the primary point for Thayan attack. It has been besieged at least five times but never fallen, due to the solid stone walls created by the Witches. Its large fishing fleet nets sturgeon in the nearby lake that bears the town's name. Rashemen is an old land, with settlements dating back to the time when it was disputed ground between Narfell and Raumathar. Years after the collapse of those two empires, the people united to form a nation, aided by the Witches, who offered their protection in exchange for the right to select the kings and war leaders, since the first one in -75 DR.
Rashemen has defended itself against Mulhorandi invasions, multiple Thayan invasions, and even the Tuigan horde, surviving it all and holding its territory. With its traditional enemies (the Red Wizards) pursuing other tasks, Rashemen is fortifying its southern border in anticipation of eventual treachery. Dangerous wildlands, fierce berserkers, and a suspicious population deter all but the most resourceful outlander adventurers from exploring Rashemen's mysteries. The Hag Queen: Citadel Rashemar was besieged and destroyed by the Tuigan horde. Now a pile of shattered stone, it is used as a lair by goblins, giant spiders, and hags. These creatures have begun to harry the nearby Rashemi villages, directed by a shrewd hag with formidable sorcerous powers. Already she has slain two Witches who entered her domain, and the Wychlaran want revenge. Walk of the Old Ones: A group of Old Ones has grown tired of living lives of isolation and wish to see more of the world. The Witches denied the Old Ones their request, fearing that their knowledge could fall into the wrong hands. The unhappy Old Ones chose to escape anyway, and they need a guide for the few tendays before they return to their duties. Meanwhile, agents of rival powers (such as the Red Wizards and the Zhents) are trying to capture the male Rashemen wizards for the information they hold. The adventurers may need to negotiate between the Old Ones and the Witches, for the latter are intolerant of those who shirk their duties. Thay is a nation ruled by cruel wizards who rely on slavery to provide them with the wealth and luxury they need to support their magical research and dreams of conquest. The land is ruled by eight zulkirs, the most powerful wizards of the land. The zulkirs in turn choose the land's tharchions, civil governors who manage the mundane affairs of the realm and serve at the pleasure of the Red Wizards. The power of the Red Wizards extends far beyond Thay's borders. Red Wizard enclaves exist in dozens of major cities through- out the Inner Sea lands, exchanging magic items for the goods, riches, and - in some cases - slaves of a dozen lands. The Thayans are widely disliked and distrusted, but their growing stranglehold on the trade in magic devices makes them virtually indispensable to many of their clients. The zulkirs back in the homeland grow rich beyond belief with the spread of their sinister trade. They constantly scheme and plot against their neighbors. (See Organizations for more information about the individual zulkirs.) Thayan armies have marched on Aglarond and Rashemen many times, and folk think it is only a matter of time before the Thayans revert to their old habits of taking what they want through force of arms and deadly spells. To Faerûnians, Thay is a dark and evil empire where cruel Red Wizards endlessly crack whips over screaming, groaning slaves who are spell-transformed into weird monsters as their "reward" for back-breaking service. The truth is only a little different. The Red Wizards form an elite Class, the nobility of the land. Through the vast, regional bureaucracy administered by their hand picked tharchions, they govern Thay's laws, commerce, and society. Free Thayans fall into one of six classes: Red Wizards, bureaucrats, priests, merchants, soldiers, and artisans or skilled workers - barely a step above slaves themselves. Neither priests nor merchants are especially common in Thay. All Thayan children are examined for magical aptitude at an early age. Those who show signs of potential are removed from their parents and subjected to ever more rigorous schooling in the arcane arts, culminating in apprenticeships to the Red Wizards, who are notoriously careless of and abusive toward their apprentices. (Those whose talents run to sorcery channel their talents into wizardry, suppress them, or leave the country. The Red Wizards despise sorcerers, who don't follow the carefully regimented system of 'magical schools'.) The survivors become Red Wizards upon completion of their training, but the organization is far from democratic or benevolent - to hold real power, a young Red Wizard must master as much arcane might as she possibly can, and wield it ruthlessly and without hesitation against her fellows. Thayan policy is decided in council by the zulkirs, wizards representing schools of magical specialization. Each zulkir is elected by Red Wizards prominent in that magical school, and then serves for as long as she can hold office - alive or in undeath. Although every zulkir has rivals seeking to destroy her, zulkirs tend to be shrewd, ruthless, and good administrators (or they don't last long). Thay is divided into "tharchs," each ruled by a tharchion responsible for local roads and bridges, sanitation, military defense, irrigation or water transport, and peacekeeping. The tharchions, or civil rulers, in turn appoint autharchs, or bureaucrats and, underlings. Autharchs are generally chosen from the most competent soldiers, well-off families with a tradition of civil service, or more rarely merchants or free Thayans who simply demonstrate unusual competence. Red Wizards occasionally scheme for an appointment as a tharchion to increase their own personal power and wealth. All of the tharchions and zulkirs can muster their own armies, and many Red Wizards have multiple bodyguards, so Thay supports a haphazard array of fighting forces. These units range from nearly naked goblins fighting in mobs to plate-armored and highly trained cavalry riding flying steeds or magically augmented mounts of various sorts. These forces often skirmish unofficially when their rulers have a disagreement, or when one catches another doing something overly illicit. Thay used to fight Aglarond and Rashemen almost continuously, but tasted defeat far too often to continue such enthusiastic hostile ties. In the increasingly uncommon "general war" situations, Thay can send at least two special units into battle: the vast Legion of Bone, a regimented unit of marching armored skeletons, and the fearsome Griffon Legion, four hundred battle-skilled Red Wizards hurling spells and dropping incendiaries from griffonback. Thay has a small but growing "middle class" of free folk who are either servant-staff to zulkirs or tharchions, or else merchants and traveling trade-agents. Free Thayans are perhaps the closest to what the folk of Thay would be like without magical oppression. They are careful folk who show their emotions as little as possible, affect a manner of smooth politeness, and take secret glee in watching dancing, revelry, foolishness, and amusements, but never dare to participate. They tend to eat and drink prodigiously but have strong constitutions (and tolerances for poisons and bad food), and rarely show drunkenness or ill effects from what they consume. In Thay, slaves are everywhere. Thriving slave markets hawk the living wares of slavers who bring "merchandise" from Amn, Calimshan, Chessenta, Mulhorand, Semphar, and Thesk. The majority of slaves are human, but orcs, goblins, gnolls, half-ores, and halflings also appear for sale. Thayans still mount slaving raids, on other free lands, but most slaves are acquired in trade. Although slaves may be altered in any way by their owners at a whim, they are forbidden to cut their own hair or choose their own garb (most are kept near naked). Many slaves last only a few years before dying or being put to death. Thayans frown on those who treat slaves with wanton cruelty (crippling or weakening punishments are bad for business, wasting valuable property). Nevertheless, slaves are put to death for minor infractions, to guard against the greatest fear of all noble Thayans: bloody and countrywide slave uprising. The Red Wizards of Thay are infamous for their "immoral" magical experimentations - but they'd be far more of a danger to the rest of Faerûn if the internal infighting among their ranks wasn't so vicious and vigorous. Red Wizards shave all the hair on their heads (including eyebrows and often eyelashes), and sometimes all over their bodies, and most tattoo themselves heavily. Such tattoos are often a means of magically storing spells for emergency use (the source of many "miraculous escapes" for Thayans imprisoned in other countries). In Thay, only Red Wizards are allowed to wear red robes. They learn iron self-control as quiet, careful underlings to powerful senior mages, and only dare to scheme when they command a powerful roster of personal spells. Thay is an ungainly, internally riven powerhouse of a nation - but also one that is feared, hated, and carefully watched by all its neighbors. Thay is a hot, often dry, wind-scoured land where many thirst for freedom or greater power. A careful and constantly renewed web-work of spells keeps the weather good for crops with soaking rains on most nights and warm but not harsh heat during the day. The abundant slave power maintains high food production, allowing locally made beer and bread to sustain slaves along with the endlessly available boiled or pickled vegetables. Thay exports a lot of grain, but could sell a good deal more if its rulers weren't so wary of attack and didn't keep building (and filling to bursting) granary after granary. Lake Thaylambar: This vast, deep lake provides rich fishing grounds despite its dragon turtles, which enjoy its icy depths and snack on fishing vessels. Thayan nobles occasionally go on hunting expeditions for the creatures, with about half coming home with a trophy and half never being seen again. The Plateau of Thay: The heart of Thay is its central, heavily settled plateau. Here frequent human and gnoll patrols keep a vigilant watch for outlanders and escaped slaves, operating out of small fortresses known as tax stations. Inquisitive mages of other lands who dare to scry onto the plateau discover that overlapping wards in many places now approaching the strength of the fabled mythals of old - overlie the land, effectively preventing spying from afar. Those who have reason to be wary of the Red Wizards greatly regret this divination "shield" and seek other ways to learn the Thayans' schemes. Surmarsh: Tribes of lizardfolk inhabit this dreary, fever-ridden swamp. Some of these tribes serve as occasional troops in the armies of Thay, which is considered a great honor to the scaly people. Nobles enter the swamp to hunt the monsters that flourish here. Thaymount: At the center of the Plateau of Thay loom the rugged volcanic peaks known collectively as Thaymount. Earth quakes and ash eruptions indicate that local volcanism is increasing, but the Red Wizards haven't abandoned their fortresses on the mountain flanks. Instead, they seem to be rushing to and from them more often, called to secret councils and engaged in building new and ever larger fortifications. 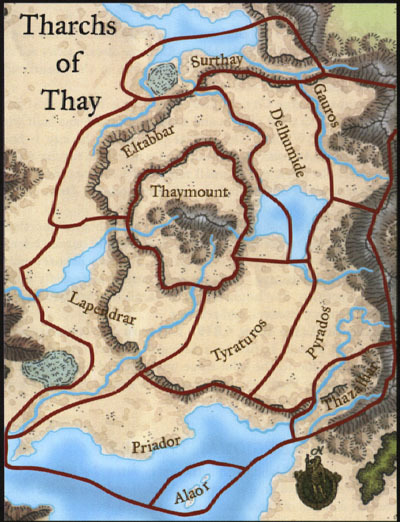 Thay's military reserve (thousands of gnolls, darkenbeasts, and other fell creatures) is quartered in Thaymount, and the mountains are also known to contain both the rich gold mines that have funded the Red Wizards for years and worked-out mines that descend into the Underdark. Thaymount is home to the ancient Citadel (see Plots and Rumors, below) where it's whispered that runaway spells still rage uncontrolled. Secret force's of magically twisted folk and monsters have emerged from the grim fortresses of Thaymount and gone out into Faerûn on sinister missions. Thay's magical workshops and armories lie in this region, too, worked by hundreds and hundreds of the younger Red Wizards at the command of their superiors. The Red Wizards have divided Thay into eleven tharchs each ruled by a tharchion. Alaor: This tharch consists of the pair of islands off the southern coast of Thay and houses the nation's largest naval base (large city, 29,720). Heavily damaged in the salamander war (see Regional History, below), it was rebuilt with modern facilities. Delhumide: This tharch held the capital of the Thayan province when Mulhorand still controlled this area. The capital and other signs of civilization were destroyed in the independence war. The tharch now consists of ruins and slave farms. Its tharchion is a proponent of the magic trade, hoping to increase the prosperity of his poor territory. Eltabbar: This tharch is of tremendous political importance. Its tharchion (Dmitra Flass, LE female human Ill7/Red8) strives to discourage feuds and intrigues among the zulkirs and advocates expanding the trade in magic items even further. She is married to the High Blade of Mulmaster, a political union that has brought Thay greater access to the Moonsea through its Mulmaster enclave. The tharch contains the Thayan capital, also called Eltabbar (metropolis, 123,120). The city is huge, packed with slaves, and home to numerous slave auctions. The canals flowing through the city once helped to empower a spell that kept a great demon imprisoned under it, although that demon has since escaped due to weakening of the spell by an earthquake. Gauros: This tharch on the northeastern end of Thay often skirmishes with Rashemen over its mineral-rich hills. The tharchion of Gauros hates Rashemen and constantly schemes to destroy that land despite mandates from the zulkirs for a temporary peace. Lapendrar: A clerk of Kossuth rules the southwestern tharch of Lapendran. Though theoretically independent, the city of Amruthar (metropolis, 41,040) pays tribute to Thay to keep from being annexed. There is a minimal Thayan presence, and while no Red Wizards live here, some do visit The wealthy rulers live decadently and luxuriously. Some Amrutharans want to sever all ties with Thay, making them fully independent, and some want to join Aglarond, which realistically is too far away to provide any aid. Escalant (metropolis, 28,728) has a history of alternating between independence from Thay and occupation by the Red Wizards. Currently Thay is in charge, although the locals are left to go their own way. The sprawling city is garrisoned with gnolls from the Thayan army. Priador: The people of the Priador tharch have been terrified into submission by their tharchion, who rules with an iron fist. Currently the region prospers, but the zulkirs plan to intervene if trade falls off. Bezantur (metropolis, 136,800), Thay's largest city, is vital to the country's prosperity due to its sea trade. The city is plagued by powerful thieves' guilds. It is a major religious center, with temples to almost every deity but Azuth and Mystra. Pyarados: The mountains of this tharch contain rich minerals. The walled city of the same name (metropolis; 54,720) is open to adventurers, even foreign ones, as long as these visitors don't threaten Thayan interests. The city's foreign quarter lies outside the city walls. The authorities turn a blind eye to crime, leaving street justice to settle matters. The city is often a launching point for adventurers delving into the Sunrise Mountains. Surthay: This small tharch is mainly used as a staging ground for attacks against Rashemen. The locals survive through subsistence farming and trade with Theskian merchants. The city of Surthay (large city, 17,784) was originally built as a stronghold against attacks by the Rashemi, but now serves as a base for troops ready to attack that nation. Its proximity to the swamps means it often suffers strange plagues. Thaymount: This tharch has a large military fortress and gold mines among its central mountains. Because Thaymount is used as the headquarters for the zulkirs, activities here are kept secret from all but the most privileged Red Wizards. Thazalhar: This tharch controls trade routes to Mulhorand. Its tharchion is a retired general who extracts high tolls for caravans and travelers. The place is mostly a graveyard, since the wars with Mulhorand caused the area much damage. At night some portions are haunted by undead and the spirits of slain warriors. Tyraturos: This well-patrolled thatch controls the two main high ways through the country. The city of Tyraturos (metropolis, 68,490 is large and sprawling, with a huge slave marketplace where almost any creature can be had for a price, including exotic ones such as lamia, centaurs, and drow. Visitors must be careful to avoid being captured and sold into slavery only a few blocks from their inn. For centuries, the region of Thay was under the rule of the powerful Mulhorandi Empire. Its native people, a Rashemi race, were subject to the rule of a noble class, the Mulan of Mulhorand. The great mage Ythazz Buvarr, a member of a Mulhorandi secret society called the Red Wizards, sought to create a separate realm where wizards would rule instead of the god-kings. Ythazz and his followers raised an army and sacked the capital of the Thayan province. The Red Wizards succeeded in destroying all opposition from their former masters and established the land of Thay in 922 DR. In the years since then, Thay has tried many times to annex portions of Aglarond and Rashemen, sometimes with the assistance of drow, demons, assassination, or even artificially created natural disasters. Each attempt failed, mainly because the Red Wizards could never successfully cooperate with each other. The most recent attempt involved bargaining with the leaders of the efreet and salamanders from the Elemental Plane of Fire. When their allies turned on them, the clerics of Kossuth, lord of the fire elementals, were able to persuade their deity to intervene and rout the other outsiders, greatly elevating Kossuth's church in the eyes of the Thayans. With outright conquest denied them, the zulkirs discovered that a great demand for Thayan goods - specifically magic items - exists in the cities oi the Inner Sea. Given the number of Red Wizards and the traditions of years of servitude as apprentices and low-ranking members of the organization, the Red Wizards found that they could easily mobilize a large number of mages to manufacture potent magic items for sale and undercut other wizards with commercial aspirations. Over the last several years, this trade has grown from a convenient way to fill the zulkirs' coffers and extract useful value from apprentices into an extremely rewarding enterprise. At the direction of one zulkir or another, mid-ranking Red Wizards have established enclaves - walled compounds or fortress-like footholds - in Faerûnian cities to purvey their magical goods in exchange for the wealth of a dozen lands. Given the success of the mercantile efforts and the traditional failures of overt conquest, a new faction has arisen within the Red Wizards, supporting mercantile rather than military expansion. Grudgingly, the zulkirs (led by the lich Szass Tam, the zulkir of Necromancy and arguably the most powerful Red Wizard in Thay) have agreed to cease direct and overt hostilities against other nations for a time to see whether trade alone can accomplish their objectives. In the meantime, tenuous truces hold along the Aglarondan and Rashemi borders. Thay's aggressive slaving and the abominable conditions of the slaves within its borders attract good adventurers eager to strike a blow against the cruel Red Wizards. The Buried Ones: One group of adventurers exploring the Sunrise Mountains has come back with a tale of strange pale humans they found in a newly opened cave. These humans have the same features as the ruling Mulan race in Thay, but are as pale as albinos and almost completely blind. They wield weapons of gold that are as hard as steel and cast strange magic that gives off no light The adventurers told the story in Pyarados before they left to fight these creatures, who many in Thay believe to be a degenerate off shoot of Mulhorandi trapped centuries ago. The Citadel: On the northern edge of the mountains in the Thaymount tharch is an old fortress simply called the Citadel. It predates the arrival of humans in this area and was built by a race of intelligent lizardfolk, possibly the progenitors of the now-primitive tribes living in the Surmarsh. Infested by troglodytes, rasts, and other subterranean species (including drow), the Citadel is said to connect to the Underdark. Red Wizards and powerful Thayan adventurers explore the fortress. Recently the number of expeditions has increased, many of them sponsored by the zulkirs themselves and often including foreigners. Whether these sponsored adventuring groups will be allowed to leave Thay with the information or treasure they find is another matter. Thesk is a land of shrewd but friendly merchants and able farmers. The trade route that leads to the far land of Kara-Tur allows the Theskians to see all kinds of people and interact with many cultures, making Thesk one of the more tolerant nations in Faerûn. After being decimated by the Tuigan horde, the people of Thesk are rebuilding their cities and towns, and they have even made a home for the orc army left behind by the Zhentarim. The Theskians' familiarity with quality and obscure goods makes them skilled at appraising items. Arcane magic in this land is rare; that fact, along with the influence of the Shadowmasters, a thieves' guild backed by the church of Mask, makes Thesk more than just another realm of traders. People in the rural areas of Thesk live like common folk, tending to their soil and livestock. Unlike in other parts of Faerûn, a number of the farmers and ranchers in Thesk are full-blooded orcs. Orcs also inhabit the cities, blending in with the other merchants and workers who serve the Golden Way, the major trade route that connects Faerûn to the Utter East. Acclimatized to strange faces, languages, and goods, the people of Thesk have a long history of profiting from caravans from all parts of the world and go out of their way to welcome visitors. Thesk lies between the Plateau of Thay and the Forest of Lethyr. Vast portions of the land are virtually empty - most folk live along the road from Telflamm to Two Stars. Ashanath: This unsettled region's good soil is covered in thick, short grass, and small herds of wild oxen and ponies roam its entire length. It would be an excellent place for farms and could easily support one or more city-states except for the tornadoes that race across the landscape in summertime, sometimes as often as once a tenday. The tornadoes are thought to be side effects of the weather-controlling magic the Red Wizards frequently use to benefit their crops. The plain is also home to bulettes and ankhegs. Dragonjaw Mountains: The clans of gnomes in this mountain range are frequent visitors to the human city of Milvarune, which exists mainly to distribute the tools, inventions, weapons, jewelry, and quality iron ingots the gnomes produce. The mountain is populated by at least two copper dragons that engage in joke-contests with the gnomes on an annual basis. The Golden Way is by far the most important feature of Thesk. Nyth (Small City, 11,501): Previously under the control of Telflamm, Nyth once again considers itself part of Thesk and trades freely with its sister cities, including Telflamm. The city received its name from the will-o'-wisplike creature that used to haunt the western edge of the Forest of Lethyr. A cabal of wizards eradicated the nyth in a battle of mutual destruction. Since that time, wizards have been respected in Nyth but are thought doomed to meet a bad end. Phsant (Large City, 21,564): This city is famous as the site of the defeat of the Tuigan horde by the armies of the western alliance. The orc soldiers from the Zhent army settled in this area and have adapted remarkably well. Some work on farms, some have purchased small farms of their own, and others work as mercenaries, laborers, and guards. The other orcs in Thesk work as miners in the Thesk Mountains, returning here to visit with their old tribemates. Some of the orcs have married local women, but the rest are still looking for wives, drawing a steady flow of half-orc women to this area in search of strong husbands of a more civilized mindset than they might find in an orc tribe. Tammar (Large Town, 3,594): Nearly razed to the ground by the Tuigan, this city was held for a while by a large group of bandits who extorted heavy tolls from caravans passing through their land. The oligarchy paid a squadron of one hundred orcs to root out the bandits, and now the tusked warriors are hailed as heroes in this town, which has been rebuilt and resettled by its original residents. Telflamm (Large City, 23,361): This city sits at the end of the Golden Way, profiting greatly from the trade route by controlling access to the Sea of Fallen Stars. Independent from Thesk but closely allied with its neighbor, Telflamm is ostensibly ruled by a "merchant prince." Actually, the city is firmly under the control of the Shadowmasters. This thieves' guild owns the city's inns, festhalls, and gambling halls, in addition to extorting "protection" lees from merchants and wealthy alike. The Shadowmasters are led by the local high priest of Mask (whose temple in the city, the House of the Master's Shadow, is Faerûn's largest to that deity). He knows a ritual that allows a worshiper to exchange a portion of his or her life force for the ability to shadow walk once per day. This ability has served the guild greatly in the year since the ritual's discovery. The Shadowmasters maintain safe houses in every city in Thesk. Founded in 937 DR by a coalition of friendly trading and agricultural cities, Thesk has long been a land of farmers profiting from the trade that passes through their country to and from the lands of Kara-Tur. The Golden Way has allowed Theskians to become very wealthy, which led to their current form of government. The wealthiest person in a city becomes mayor, and joins the other mayors on a council that governs the nation. Sparsely populated and with few natural resources, Thesk has avoided the conquering gaze of the Red Wizards and is instead a reliable trade partner for food and exotic goods brought in on the Golden Way. Thesk suffered greatly from the attacks of the Tuigan horde, because the nomads used the well-trod road to attack several cities in quick succession. Although the horde was defeated, Thesk was disrupted for years by the presence of refugees of the Tuigan attacks. The thousand orc soldiers left behind by the Zhentarim added to their paranoia, for orcs had not been seen in that region for hundreds of years, and some considered them demons. The Shadowmasters of Telflamm bribed and coerced the orcs to resettle away from their city. After being rebuffed by the druids of the Forest of Lethyr, the orcs settled peacefully in and around Phsant, where the locals eventually grew to accept them, particularly in light of their actions in helping defeat the Tuigan horde a few miles from that city. Unlike Rashemen or Thay, which are eastern lands that do not welcome adventurers, the folk of Thesk celebrate anyone who makes their land safer by driving out monsters. They might also welcome anyone willing to contest the power of the Shadowmasters. Old Soldiers: Now that the Zhentarim have control of most of the Moonsea, they are looking to their remote agents in an effort to establish a firmer foothold in the rest of the world. In Thesk, these agents are the thousand orcs from their army. However, in the twelve years since arriving here, the orcs have adjusted to living in this region, and few have any interest in returning to a situation where they have to risk their lives for someone else's grand plans. The Zhents may try to woo the orcs back with money or capture them by force of arms.